Social meets fashion history in the tantalizing story of the boot from the Roaring Twenties and Prohibition to online shopping and fashion blogs. Weaving together such unlikely elements as Glam Rock, the martyrdom of Joan of Arc, and the Iran-Contra scandal, it shows how the modern fashion boot plays with our ideas of gender, straddling the line between practical and stylish, between fashion and fetish. 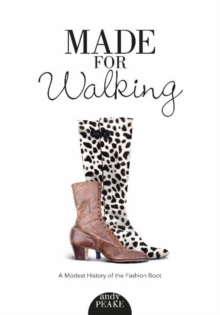 Peake, author of the popular Made for Walking blog, includes thought-provoking photos and graphs that look deeply into what boots do, and what we make them do. In the words of renowned designer Beth Levine, "Boots moved into prominence the same time The Pill did. Both were symbols of a woman's new freedom and emancipation." Whether you're a student of fashion history, a collector of vintage clothes, or someone who feels "five hundred times more dashing" wearing boots, this book is for you.